You do not need an art background to become a volunteer. The only prerequisites are an ability to relate to people of different ages and a desire to learn and share your knowledge. Volunteering at the Museum is a wonderful way to participate in your community, to appreciate art, and to open the eyes of others to the beautiful world of art available at the Museum! 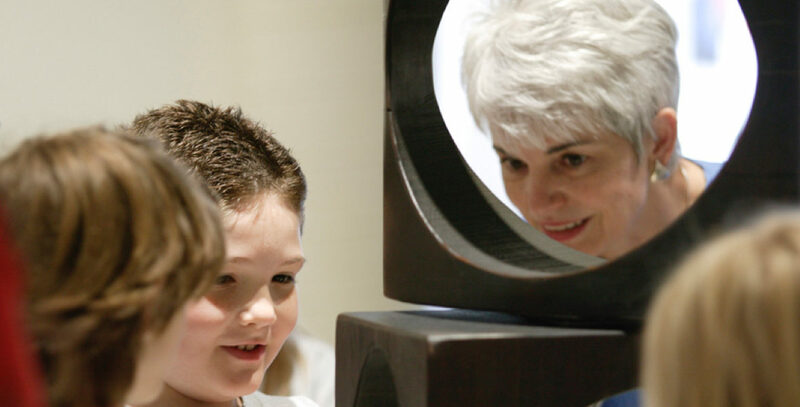 Docents play an important role in the Schneider Museum of Art’s community programs. The Museum trains docents to lead tours and field trips, and act as exhibition interpreters at museum events. Museum docents participate in unique volunteer opportunities to deliver hands-on, curriculum-linked education programs for schools and community groups. Through their contributions of time, energy, inspiration and expertise, volunteers often report enjoying their role as vital community liaisons. Prospective docents are trained for in-museum activities that focus on understanding context, building visual arts literacy, and engaging in group discussions and criticism. If you are interested in becoming a docent, please contact us at smaeducation@sou.edu, or call us at 541-552-6389.